International beer cans have their own very interesting history. Brewers from outside of the United States were not hampered by prohibition, but still did not begin to package beer in cans until the same period in the mid to late 1930's. In general, canned beer was somewhat slower to catch on in other counties than the U.S. , but the variety and history behind these cans is every bit as intriguing. It also makes older cans from Europe and other countries tougher to find. The canning of beer began in Europe in 1935. The Felinfoel Brewery canned beer at their brewery in Llanelly, Wales in Decemeber of that year. This can was a nine ounce cone top filled filled with their India Pale Ale. Simonds of Reading, started canning in the spring of 1936 with their beer and S.B. pale ale. In 1937, they issued what were likely the first commemorative beer cans. Their Coronation Brew commemorated the coronation of King George VI in 1937. 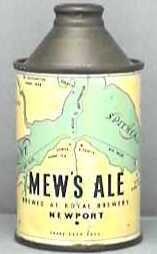 Another early British cone top was the Mews from the Royal Brewery in Newport England. Schultz likely produced the first beer can in Germany with their Export beer. Some of the most interesting beer cans ever to be produced came from the Tennent's Brewery of Glasgow Scotland. The brewery sought to spur sales of their beer cans by placing scenic pictures of Scotland and later England on the reverse of their cans. Many of the early cans in Europe were exported elsewhere. The weight saving of cans always appealed to airlines. The compactness of the cans was a major benefit when beer had to be shipped to other countries. The drinkers of the non-returnable containiners did not need to worry about retruning them for a refund. Many of these cans were shipped to supply British troops with their favorite beverage. Back in the days "when the sun never sets on the British empire" there were British outposts throughout the world. Many of these were in the hot weather spots such as Africa and the middle east. While the troops liked the pictures of home, they espcially enjoyed the a picture of a Young Lady at Trafalger Square. This picture seems sedate by modern pinup girl standards. But remember, these men were out in the desert for months at a time. They wrote the Tennent's brewery asking about this lovely young lady. Tennents realized that they had stumbled upon a better way to sell beer. The young lady, named Ann, modelled for the picture several years earlier and at the time the can was issued, was a housewife. Tennent's convinced her to resume her modelling career. They set about creating more sets of cans featuring Ann. The first of these is the Ann's Day set. The cans featured Ann photographed throughout her busy day. Fortunately for the lonely soldiers, Ann found many opportunities to be barely dressed. This was followed up by a second set entitled "Ann on Vacation". Once again there were more opportunities for Ann to be scantily dressed. Not surprisingly, practically all of these cans were exported from Scotland. Another set from Tennents was the Lager Lovelies set which featured beautiful Scottish women other that Ann. In a strange twist, Tennent tried to balance these other set with a group of cans called the Housewives Choice series. These featured wholesome housewives offering, off all things, their favorite recipes. All of the aforementioned sets are quite difficult to find, especially since many were exported out of Scotland. More common is the Tennents Ann set. The Tennents Ann set were offered in both the flat top variety and the pull tab format during a period from the mid to late 1960's. Tennent's continued with several series of cans from the late 1960's through the last 1980's. Many of these cans featured Miss Scotland contestants and models from Scotland. The Christy can pictured is a photograph of a secretary from the Tennents brewery. The Shriley can was only sold on airlines. Airlines have long preferred canned beer because of the light weight and compactness of the can. For this reason, many of the Tennent's cans show here are likely to turn up in places other than Scotland. As you might have gathered Tennents cans are a favorite of the collectors at beercans.org as well as collectors world wide. Many other countries in Europe have had a long canning history. In Germany, the first beer in cans was Export beer first produced in 1937. After the war numerous other breweries such as Henninger produced cans both in flat and cone top varieties. The early Henninger cans were brewed in Germany, U.S. Zone. This referred to the area of Germany occupied by U.S. troops after the end of World War II. The other can pictured is a beautiful Lowenbrau can from the 1950's. France canning began prior to world war two and resumed again in about 1954. The two French cans La Slavia and Champignuelles are from the 1950's with the latter saying ideal for the colonies on the side of the can showing the popularity of this container for foreign legion troops. This underscore the fact that many early European beers were canned specifically for the export market. Approximately forty different French flat top beer cans have been cataloged by can collectors. Scandinavian beer cans from Denmark, Sweden, and Norway. Scandanavia soon followed with the first Swedish cans coming out in 1955 with Norway and Finland soon to follow. The three towns beer is an early 1950's can from Sweden while the Tuborg stout is a late 1950's can from Denmark. Ringes beer is from Norway. Switzerland, and Italy also began canning in the 1950's with flat top cans instead of cone tops. The early Bulli can is a steel flat top can while the Edel Falke is an old aluminum flat top with a paper label. The Dolomiten can was Italy's first beer can from about 1954. The three cans at left are all export cans. A number of older Swiss and Italian cans, including the Dolomiten pictured here, were discovered in the alps. Hikers appreciated the lightweight unbreakable cans. The cold mountain weather helps preserve cans. Dutch beer cans including their famous Heineken. Holland produced a conetop can back in 1938. Flattop cans began in the 1950's. These early Mill and Heineken cans were amongst the first Dutch beer cans. The canning of beer stopped completely during World War II. U.S. WWII can production was directed to overseas troops. Belgium began canning in the 1950's with cans in steel flattop and aluminum conetop cans. Two early examples, the Ekla and Three stars , are shown below. Canning in Portugal and Spain began in the late 1960's and in Greece they began in the mid 1960's. The Aguila flat top and Fix flat top are likely Spain and Greece's first cans. In eastern Europe canning likely began in Czechoslovakia in the late 1930's and resumed in the 1960's. The can at right is the original Budweiser Budvar can. The Budweiser brand originated in what is now the Czech Republic. It has a brewing history of over 700 years in the town of Ceske Budejovice. This David versus Goliath battle over the Budweiser trademark has been going on for nearly 100 years now. The Budweiser Budvar brewery site can tell you more. As the Budweiser Budvar brewery has attempted to move into new markets, they have run into opposition from giant Anheuser-Busch. Canning was very limited in communist Hungary. The middle can is a rare Hungarian five litre can. The can at left features the famous Russian bear serving up some brew. There were very few beer cans to be produced in the Soviet Union. In Asia, Japan, Australia and New Zealand were first canning in the 1950's. The Asahi brewery canned in the early 1950's but Japan was most famous for the colorful scenic cans produced in the 1960's and 1970's. In Australia the canning began in the late fifties with the Queensland, South Australian and Leopard breweries leading the way. The Adelaide and Miller's are two of Australia's early cans. The Bavarian Old Style Lager can below was made for operation Deep Freeze in the Antarctic. Two versions of this can were sent to cold weather researchers in need of a cold one. The West Arm can at left was made for a New Zealand power project in 1968. Japan produces arguably the highest quality beer cans today. They even manage to apply high quality graphics to aluminum can. They have also produced an astounding variety of large 2 and 3 liter cans. The series of cans commemorating the Kawasaki Bridge, connecting two of Japan islands are a prime example. The other two cans at the far left are from a two different sets of Japanese cans. The skier is part of the Suntory Brewery Viva series. The Mount Fuji can is from the Suntory "Discover Japan" series of cans. Malaysia began canning beer in the late 1960s. Other countries in Asia and the middle east did not begin canning until the 1970's , 1980's or 1990's. The Anchor and Eagle cans were produced in Malaysia. The Bar Maids of the World set of seven can featured several attractive bar maids in this popular Malaysian set. Sea Gull from India, Skol from Iran, and Falcon from Lebanon. The Sea Gull below was produced in India. Many of the middle Eastern countries no longer allow alcohol to be sold. The Skol and Falcon cans were produced for Iran and Lebanon respectively. Skol is a brand that has been sold under license all over the world. Skol cans have been produced in Iran, Canada, Australia, as well as Europe. There have been no Iranian beer cans since the end of the Shahs rule. Numerous countries in Africa have canned beer. Among the early canners and South Africa, Southwest Africa, Rhodesia and Algeria. They began in the late 1950's. Other counties brewed beer in the 1970's to appeal to soldiers in the foreign legions. Small countries such as Portugese Guinea, Madagascar , and Angola would not have canned beer except to appeal to the European soldiers. Currently many new countries in Africa are canning presenting great collecting opportunities for collectors everywhere. The first can celebrates the anniversary of the indepence of Bophuthatswana in 1987. The three horses can was produced in Madagascar in 1973. The cristal was produced in Portugese Guinea in 1974 shortly before their independence. (now Guinea Bissau). The Hansa can was produced in the late 1960's in Southwest Africa. (now Namibia) The Lion and Highlander are from South Africa with the first an early flat top can and the second was made for a television show in South Africa. In South America and Central America canning began in the 1940's with Cuba and Venezuela leading the way. Argentina followed in the late 1950,s with Bieckert producing flat top cans. It was not until 1972 that Brazil began producing cans with Skol producing cans for the sesquicentennial. Bolivia Peru,and Chile also started canning in the 1970s. with other countries starting in the 1980's and 1990's. The Polar can is a mid 1960's can from Venezuela and the Zulia is a can from the late fifties from Venezuela. The Hatuey can was produced in Cuba in the late 1940's. Canada began canning in 1948 with the Molson Export being the first flat top and Dawes being the early conetop producer. There are only around or so different Canadian conetops. Canadian flat tops number about eighty-five. Canada switched to pulltab cans in 1964 and experimented with aluminum cans in 1964-1967 but had difficulties due to can leakage. As you can see many countries throughout the world have had long and illustrious canning histories. Although the U.S. has been the most prolific other countries have made many wonderful and colorful cans. The Dow can is an uncommon variety from the mid 1950's while the Kingsbeer conetop was produced in 1949 and was one of the first conetops produced in Canada.